PASADENA- After all the drama and hype has withered away from the intriguing matchup of No. 2 Oregon playing No. 3 Florida State in the Rose Bowl Game presented by Northwestern Mutual, the Ducks were simply a more superior team. 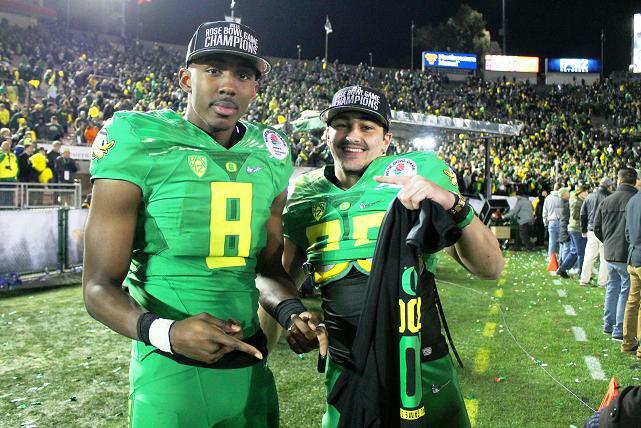 But Florida State gave the Ducks an assist in Oregon scoring the most points in Rose Bowl history. Oregon, with its Mad Max scheme of going fast, faster and then top gear-fastest gear, went by, through and over Florida State as if the Seminoles were stuck in mud all game, racking up 639 in total yards against the ACC champions. The Seminoles had a hand in that, failing to jam Oregon’s wideouts at the line of scrimmage to disrupt the Ducks’ timing offense, and unwilling to change their defensive pace by calling and running multiple blitz packages to put pressure on Heisman Trophy winner Marcus Mariota. Sure, Florida State turned the ball over four times in the third quarter which led directly to the Seminoles being blown out in the College Football Playoff semifinal game. With that being said, even if Florida State did not turn the ball over that many times and put up more points on the board, it was evident from the start of the contest that Florida State looked simply confused and overmatched in the speed and athleticism department. This is why, if you have six weeks to prepare for this type of team, Florida State’s defensive coaches should have simplified matters for their players. Instead of being aggressive on the defensive side of the ball, the Seminoles went passive and got destroyed because of it. Florida State allowed Oregon to dictate the tempo of the game, which is an absolute no-no and put the Seminoles defensive players in a can’t-win situation. You can’t play zone defense against a super efficient quarterback like Mariota. He and his fleet of speedy receivers will take you to lunch and dinner at the same time and then hand you the tip tab, which is what Oregon did to Florida State. With no real pressure on Oregon quarterback Marcus Mariota, the Seminoles played safe and got burned, especially in the second half when they failed to change their defensive approach. Florida State’s defense couldn’t stop water on this night, let alone try to put a halt to the dynamic playmaking of Oregon, the most explosive offense in college football. One could make the argument that Florida State didn’t even belong on the same field as Oregon. But there neither here or there. Florida State came into the Rose Bowl unbeaten in 26 games, including winning the national championship with Jameis Winston behind center as their starting quarterback. If not for the play Winston this season, Florida State would not even have been in the Rose Bowl and national title conversation. Though he didn’t have the numbers he put up a year ago when he won the Heisman Trophy as a redshirt freshman, Winston bailed out the Seminoles on many occasions during the 2014 college football campaign. The guy is a winner. And without his leadership, Florida State would have lost three or four of the close games they won to stay undefeated. And if it was not for Winston, Florida State probably would have not gotten on the scoreboard against Oregon, which now goes to play for the national championship against Ohio State on Jan. 12. This game, unfortunately for college football fans, didn’t come down to the wire with both quarterbacks going back and forth in a duel everyone was expecting. Both Mariota (338 yards passing, 2 TD; 62 yards rushing, TD) and Winston (348 yards passing, TD) played well. What this game came down to was Florida State’s inability to make the proper defensive adjustments to put their players in position to succeed and Oregon’s knack to go for the jugular and exploit the weakness of an opponent. 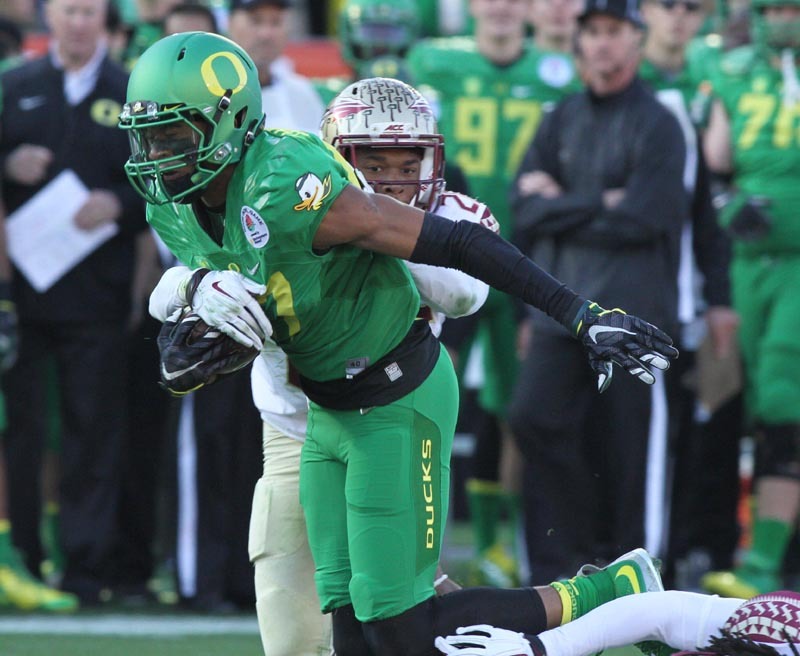 Florida State showed weakness on Oregon’s first series of the game when the two cornerbacks for the Seminoles lined up 8-10 yards off the Ducks’ wide receivers. Right off the bat, Oregon’s speed had crept up in the minds of Florida State’s defensive players. Mentally, the Seminoles were already defeated on that initial possession. It took three quarters for it to officially come to fruition.